Length is measured shoulder to hem. Meet our New Jaya Dress , a reworked version of our best selling Jaya dress now with pockets and a little less piping detail ! 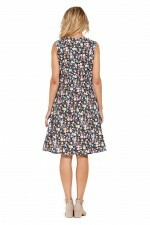 You'll love this Bias cut super flattering dress in our gorgeous Kanji print , an exclsuive Japanese floral print .So easy to wear the Rasaleela " New Jaya " dress has got summer written all over it . An all–occasion dress from morning to night, flats to heels – the choice is all yours.